Back in my counted cross stitch phase I made these rabbits as part of a spring centerpiece, and still enjoy getting them out each year, along with a bowl of blown eggs saved from Easter egg decorating sessions. You might be wondering where the paper-y part of this post is... oh yes, a bit of paper is involved! The rabbits are stitched on ovals cut from glimmering gold perforated paper and are backed with patterned wallpaper. Of course the mention of rabbits is never more appropriate than at this time of year. Last spring in fact, a rabbit decided to build her nest smack in the center of our front lawn to the delight of the neighborhood kids. How it was noticed still amazes me, except that children have built-in radar for these sorts of things, don't they?! In case you've never seen a bunny nest (I hadn't), this unimpressive little bit of fluff is what one looks like. It's an extremely shallow hollow in the ground, just an indentation really, a couple of inches deep. The mother doesn't stay there - instead, she steers clear to avoid bringing attention to the nest. Every now and then, we would notice her hovering over it while she nursed her pair of bunnies. Wishing you a happy spring or autumn, depending where you are on the planet! That is amazing! I have never seen a bunny nest, Thanks for the pictures! super cute! That baby bunny is adorable! I haven't seen much of the bunny that moved into my woodpile last spring. I saw him/her a bit in the fall, but not since then. 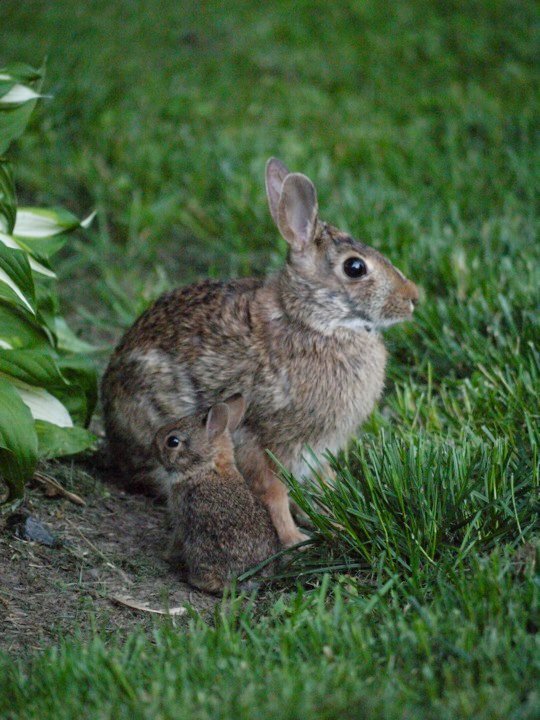 I'm wondering if there will be baby bunnies around here this spring! Such a sweet post Ann. The picture of the little one with its mother is so adorable. Love those bunnies ... shame about the hostas, though! Ann your cross-stitch eggs and your dyed eggs on the table are as beautiful as the bunny pics. Nature is amazing, how those little ones survive such cold nights and mornings is wonderful. I once raised a baby hare that just escaped the wrath of a ride-on-lawn-mower midst some long grasses. Philippa, it's okay... if the bunnies don't eat the hostas, deer, slugs, or drought will do them in before the end of summer. It's pretty much a losing battle each year, but they sure do look pretty in the spring. Carole, oh yikes, what a close call with the mower! Oh, and I thought you might be interested in this chess set: http://paperplateandplane.wordpress.com/2010/10/17/rolled-paper-chess-set. awwww.. too cute.. such cute little bunnies.. love your cross stitch ones too.. I would love to see something poking out of the ground even..lol your plants look lovely..
How interesting. Thanks for sharing about the cute rabbits. The cross stitch ones are lovely too. "awwwww" for sure! what sweet things. we have a lot of them around here. yes they eat the heads off my tulips. but they are cute, especially when you see the young ones hopping around in grass that's taller than they are. the one in my header was a visitor from last year...a sure sign of spring. Awwwwwwwwwwwwwwww is right!!! Darling pics and paper eggs too! Thanks for sharing. AWWWWWW they are so adorable, and I like your stitched eggs to! Aaaaww, indeed! Mummy luvs bunnies. aahhh i remember you talking about this bunny family! man, was it really last year? how time flies. i can't get over how cute baby bunnies are. so ridiculous. i have never thought to cross-stitch on paper, what a clever idea! it looks so intricate! really beautiful! Lu, that travel chess set is really something! I love your Easter decorations, your dyed eggs and the cross stitch bunnies are very cute. Happy Easter to you and your family.